Mega Sale! Save 26% on the Mermaid Bingo Party Game for All Ages Great For Kids and Adults for 24 Players Under The Sea Ocean Theme by Happy House Merchandise at Animal Backgrounds. Hurry! Limited time offer. Offer valid only while supplies last. Birthday parties will be more fun with this cute colorful bingo game for all ages! Each card is unique and made of durable cardstock paper, 5'' x 7''. Birthday parties will be more fun with this cute colorful bingo game for all ages! Each card is unique and made of durable cardstock paper, 5" x 7". Use your imagination for bingo markers: small candy kisses or treats in pastel colors, erasers, foamies, etc. Supply fun prizes to complement this festive party game! All the girls at the party will love this mermaid fish themed game. Cute design featuring mermaid tails, seahorse, waves,seaweed and seashell- will make a splash with the birthday girl! Compliment the rest of your party decorations and invitations with this decorative game kit. Fun Party Games for All Ages on Durable Cardstock 5"x7"
Add fun festive bingo markers and prizes to complement this festive party game. Add a fun twist to your summer pool party! 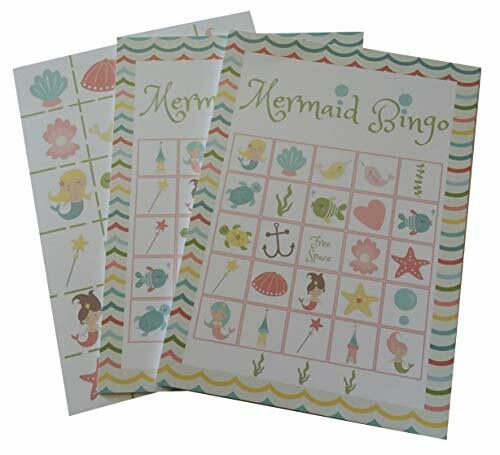 Perfect for kids or adults, these bingo cards are designed with cute mermaid artwork featuring a variety of creatures- majestic mermaids, starfish, castles, shells, narwhals, and more! Make waves at any mermaid themed party- for a little one's birthday, a beach baby shower, or an underwater classroom party. If you have any questions about this product by Happy House Merchandise, contact us by completing and submitting the form below. If you are looking for a specif part number, please include it with your message.